Click here for written directions or to see us on a Google Map. What are the prices of the homes in Tucker Hill? Prices start in the upper $300k range, with some of our custom homes selling for $900k. Click here to view not only our current Available Homes, but also Build-to-Suit Options! How big are the homes and lots? Our homes can be big or small! They range in size from 1,800 square feet to over 5,000 square feet. Lot sizes start at 41’ to well over 72′ in width. If you’d like to see our current lot maps, click here to see the community maps. We feature a map showing Tucker Hill upon completion, an Interactive Lot Map, and a Static Lot Map. The last two options show available lots, available homes, lot sizes, and which builder has been assigned each lot. How big is Tucker Hill? As of January 2019, Tucker Hill had over 273 completed homes. At build-out, Tucker Hill will see the completion of approximately 625 housing units built on approximately 300 acres. For an overall glimpse at our community’s master plan, please see our Community Map. Are there other developments like Tucker Hill? Yes, there are other developments, but not in Texas. Tucker Hill has a sister – Westhaven – located in Franklin, Tennessee. As one of the largest traditional neighborhood developments (TND) in the Southeast, this SLC community is located several miles west of historic downtown Franklin. Visit Westhaven online at www.westhaventn.com. Currently, there are no other SLC developments like Tucker Hill in the DFW Metroplex. For information about other Southern Land Company mixed-use and single-family developments, please visit the Southern Land Company web site. What school district is Tucker Hill in? Tucker Hill resides within McKinney’s city limits. But, it falls within the borders of Prosper Independent School District. Learn more about PISD here. I’m a new resident. How do I get pool/Residents’ Club access and information about resident-only events? Once a new resident has closed on their home, they need to contact our Property Management Team (CMA). First step is to register/request a log-in on our resident-only website – www.tuckerhill.org . Please allow for up to 24 hours for a new log-in to take effect. Registering for this website ensures that you will start receiving event e-blasts from our Lifestyle Coordinator and all HOA communications. It also starts the process for you to receive your access key to the pool and Residents’ Club. CMA also has a Customer Care Office that can be reached at 972.943.2828 or at customercare@cmamanagement.com . More information about our HOA can be found by clicking here. Before buying a home in Tucker Hill, can I find out if the exterior changes I’m contemplating would even be permitted? While all exterior changes to a home in Tucker Hill must be submitted for approval via the HOA Design Review Application process, this can only be done by a homeowner. So, if you’re considering any Tucker Hill home and want to understand our community standards, we suggest reviewing our Governing Documents. If you’d like the advice of our Property Management Team, please either email customercare@cmamanagement.com or call 972.943.2828. What are nearby shopping options? Tucker Hill residents don’t have to go far for some of the best shopping and dining in the Dallas/Fort Worth Metroplex! Historic Downtown McKinney (only 10 minutes from Tucker Hill) offers the traditional downtown square with one-of-a-kind shops and restaurants. This area is also home-base for many of McKinney’s annual events including Bike the Bricks, Scare on the Square, and Home for the Holidays. More traditional shopping and dining can be found just 15 or 20 minutes away at the Villages of Allen, Fairview Town Center, Watters Creek in Allen/Fairview or Frisco’s Stonebriar Centre Mall. Allen also offers one of the area’s best outlet shopping at the Allen Premium Outlets. Perhaps one of McKinney’s most interesting shopping experiences for antiquing and craft enthusiasts is Third Monday Trade Days. This event actually occurs on the third weekend of each month. It features many of the same vendors that participate in another Texas favorite, First Monday Trade Days in Canton, Texas. The basic necessities are also within a 5-minute drive from Tucker Hill including everything from a Super Walmart at Hwy. 380 and Custer, a Tom Thumb Grocery on Stonebridge Parkway, a Market Street grocers at Ridge and Eldorado, a Sprouts Farmers Market at Custer and Virginia, and a brand new Kroger Marketplace at Hwy 380 & Lake Forest. You’ll also find lots of big box stores such as Target, Lowes, and Home Depot, along with fast food choices around Hwy. 380 and Hwy. 75 (Central Expressway). And finally, the area around Hwy 380 and Hardin has exploded with new businesses including Cinemark Theatres, Stein Mart, Hobby Lobby, Marshals and Costco. Want to know more? Check out the McKinney Convention and Visitors Bureau website! What are nearby healthcare options? Several state-of-the-art healthcare facilities are just minutes away from Tucker Hill. Baylor’s Medical Center at McKinney, located at Hwy. 380 and Lake Forest Drive, is a 95-bed, full-service hospital. Its nearby medical office campus now serves the more than 133,000 residents in McKinney and surrounding communities. Just south of our community at Stonebridge and Eldorado Parkway, lies Methodist McKinney Hospital. They offer concierge medical care in a modern neighborhood setting. Their emergency department offers quick care for all of your bumps, sprains,and minor injuries 365 days a year, 7 days a week. And finally, two more large hospital systems, Medical City McKinney and Texas Health Presbyterian Hospital of Allen are both within a 15-minute drive of Tucker Hill. Check out this Google Map showing where Tucker Hill resides in proximity to healthcare facilities. What is the tax rate for those living in Tucker Hill? Here is the latest tax rate for those living in Tucker Hill. Please confirm by referring to specific governmental entities. Unlike several surrounding communities, Tucker Hill does not reside within any Municipal Utility District (MUD), Public Utility District (PUD), Special Utility District (SUD), or Public Improvement District (PID). Who provides electric, gas and other utility services to Tucker Hill? Once you’ve decided to move into Tucker Hill, it’s time to figure out who to call to set up all those utility services like electricity, gas, cable, telephone, etc. We suggest starting with this page on the City of McKinney’s website that can help new residents navigate through all these details. What are the governing documents for the Tucker Hill HOA? For those interested in knowing about the Covenants, Conditions & Restrictions for Tucker Hill, our governing documents can be viewed here. In addition, here are the amendments made to these documents. Can anyone rent our Residents’ Club? Sorry, but only those living in Tucker Hill can rent our Residents’ Club. As one of our foremost amenities, this facility and adjoining pool provide for the use and enjoyment of our residents and their guests. Many residents gather here for impromptu events or book in advance for their own private parties. For more information, contact our property management group at customercare@cmamanagement.com. What is traffic like since Tucker Hill is off of Hwy. 380? A new traffic light has been installed at our main entrance at Hwy. 380 & Tremont. In addition, a new de-acceleration lane allows for traffic to slow before turning into our main entrance. What types of telecommunications capabilities are available at Tucker Hill? Our master builder partners incorporate high-end telecommunications packages into their standard features. This is coupled with access to a resident-only website maintained by our property management team. Fiber-optic home technology and intranet creates seamless communication with the world at large, and with the neighborhood community. What sets apart Tucker Hill from other residential developments in the Dallas/Ft. Worth Metroplex? Our historically reminiscent architecture primarily sets apart Tucker Hill from other communities. Secondly, a mixture of street designs that feature rear, front, detached or side-entry garages continues the uniqueness. Third, our community attracts both young families and retirees and plans resident-only activities to appeal to this wide variety of ages. And finally, with a strong horticulture focus, Tucker Hill boasts seasonal color throughout the year. Tucker Hill is being developed as a “Traditional Neighborhood Development.” Although coined by the real estate development community, the term “Traditional Neighborhood Development” (or TND) is quite simple. This development philosophy became the norm in the country prior to World War II, and has since returned in growing markets around the United States. Today’s TND focuses on authentic, period architecture, especially what was once common to the area, and not mass-produced/streamlined building. TNDs offer diverse housing styles that include features such as buildings that are closer to the street, front porches and window boxes. Narrower streets lined with a canopy of shade trees and a network of sidewalks beckon people to leave their cars parked and instead, take a stroll. Hike and bike trails traverse the community and open spaces, parks and a main public square serve as gathering points for residents. There’s a balance of public and private space, with green or natural space given a high priority in the neighborhood’s overall design. What type of architectural styles are found in Tucker Hill? Tucker Hill’s architectural styles are actually a mix of styles and sizes within each block, as you might find a quaint Tudor next door to an elegant Victorian. Of course, we make sure that they complement each other and play nicely on the same street, ensuring that you don’t see the same house repeated throughout the community. We also strive to incorporate front porches into each housing design, not only for that nostalgic appeal, but also to encourage interaction between neighbors. What is the horticulture standard within Tucker Hill? Our Horticulture Team maintains the beauty of Tucker Hill greenery found at our entrances, parks, and green spaces. And, as the seasons change, we bring in gardening experts that offer tips to residents and the general public through planned seminars. See for yourself the beauty of Tucker Hill by viewing our photo gallery. When did construction begin on Tucker Hill? Construction began in 2007, but slowed shortly thereafter due to the economic downturn. However, Tucker Hill continues to thrive as we are currently offering final opportunities in Phase 3. And, approximately 118 lots in Phase 4 are now selling. We estimate at least 3 to 4 more phases offered before Tucker Hill reaches build-out. 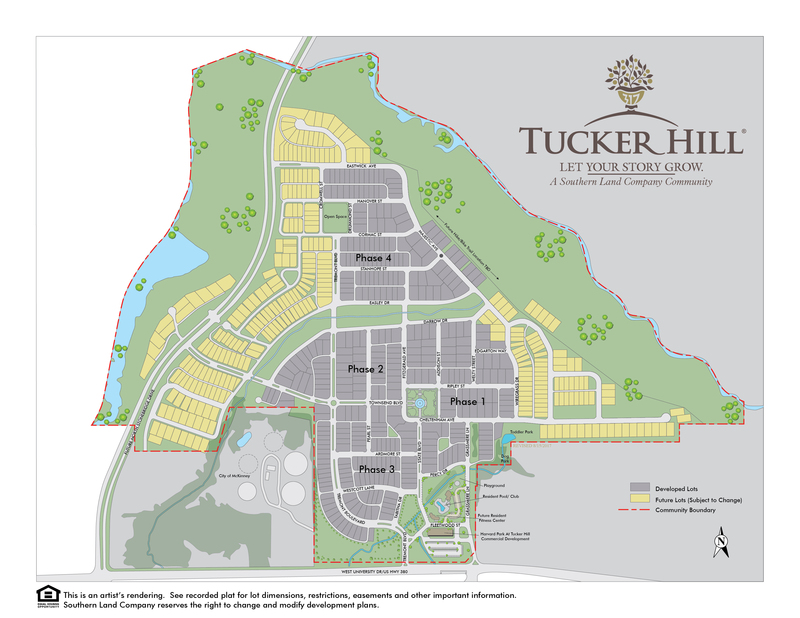 See our vision for Tucker Hill’s build-out on our Community Master Plan Map. How did Tucker Hill get its name? The inspiration to name “Tucker Hill” came from the man who originally secured the area’s 317 acres from Peters Colony. His name was Henry Tucker. The inclusion of the numbers “317” in our logo are a reminder of these original 317 acres. Just click on the question listed and our answer will appear!